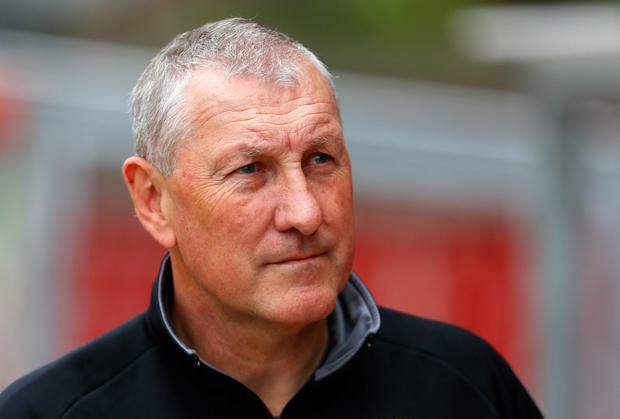 TERRY BUTCHER insists he will not walk away from relegated Hibernian and wants to lead them back to the Scottish Premiership – if he is allowed. The Easter Road side were demoted from the top flight after the former England skipper failed to halt a disastrous run of form that has seen them win just six of his 28 games in charge. They led Championship runners-up Hamilton 2-0 from the first leg of their play-off final but blew up spectacularly in the Easter Road return as they lost 2-0 on the day and 4-3 on penalties to join city rivals Hearts in the second tier. Internet rumours before the game had suggested Butcher was ready to walk away from the Leith club, no matter what the result, while around 500 fans gathered outside the stadium after the game to protest against Butcher and the board. But the former Inverness and Motherwell manager, who replaced Pat Fenlon at Hibs, insisted that he is determined to help rebuild the shattered club. "If it's down to me I will be here," said Butcher. "There was stuff on social media that I would be quitting no matter what the result was. But that was never the case. "I don't know where that came from. I want to continue, because I would like the opportunity to be able to restructure the club in the right way. I think that situation is out of my hands now." Jason Cummings' double at New Douglas Park last Wednesday had put the Edinburgh men on the verge of safety. But when Jason Scotland fired home after 12 minutes, the fear in the home ranks was palpable. They held out until the 93rd minute but were undone when Tony Andreu slammed home a dramatic and deserved leveller. With no more goals in extra-time, the match went to penalties and it was Hibs who blinked first when Kevin Thomson saw his opening effort saved by Accies 'keeper Kevin Cuthbert. Cuthbert then put the seal on the promotion party when he blocked Cummings' tired effort. Hibs were seventh when Butcher quit as Caley Thistle boss to replace Fenlon at Easter Road but he has now taken them back to the Championship after 15 consecutive years in the Premiership. "You don't know how I'm feeling," Butcher said. "It's been like watching a car crash the last two or three months."